At 9a.m., visitors to historic downtown Hot Springs will witness costumed teams consisting of 4 “pushers” and one “bather” pushing curiously decorated bathtubs – full of water – down the length of bathhouse row in a highly competitive and irreverent race. The four pushers, who must be costumed, must consist of one person carrying a large bar of soap, another wearing a loofah mitt, another carrying a bath mat, and the 4th must carry a bath towel – as any respectable bather would do. All team members must also wear hats and suspenders. Other rules for the event will be announced before and during the race – and possibly even changed mid-race! Anyone caught arguing with a judge will receive the “death penalty” – barred from bathing on Central Avenue forever! 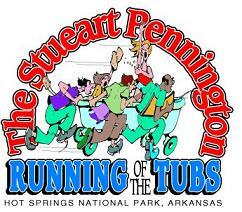 A unique event like this can only be held in Hot Springs, and you must see it for yourself to believe it! Join us at Tiffany’s Bed and Breakfast for a weekend of fun and frivolity May 18!